It ended all too soon. It seems like I have been home much longer than a couple of days. We have gotten a lot accomplished since we got home. The pool is opened and should be ready for us by the end of the week. The laundry is done, the lawn is mowed. We've spent each day with our Little Miss and we went out and got all the supplies to start painting the renovated back room. 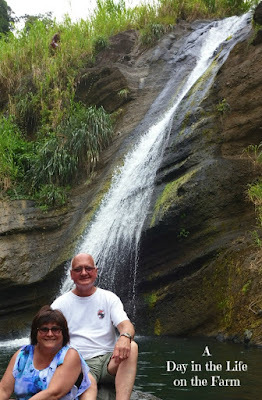 I found a few minutes to go through the photos from our Island Tour on the last day of our vacation. I will share those with you now. 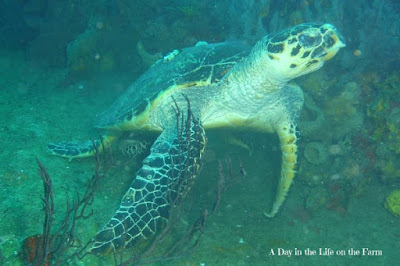 We loved our time in Grenada. 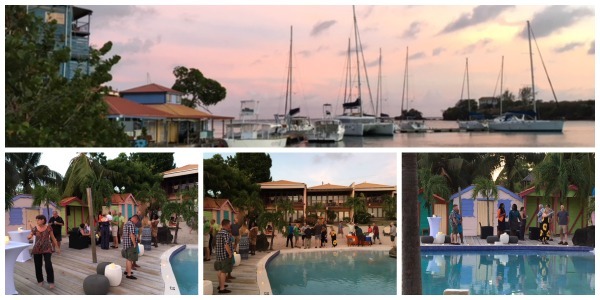 Most of our time was spent at True Blue Bay Resort. They say their mission is to keep their guests happy and they certainly do. Very friendly and accommodating staff. 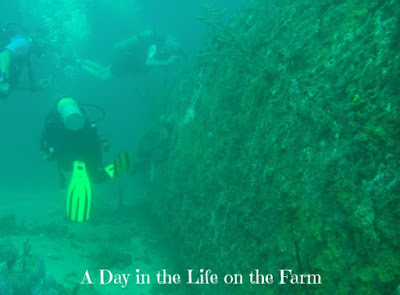 Our mornings were spent diving with Aquanuts. This is, without a doubt, one of the best dive teams we have had the pleasure of spending a week with. They pampered us completely. We didn't even have to take care of our own wetsuits. They did it all. Each morning we would get to the boat and our gear would be all set up, ready and waiting to go. 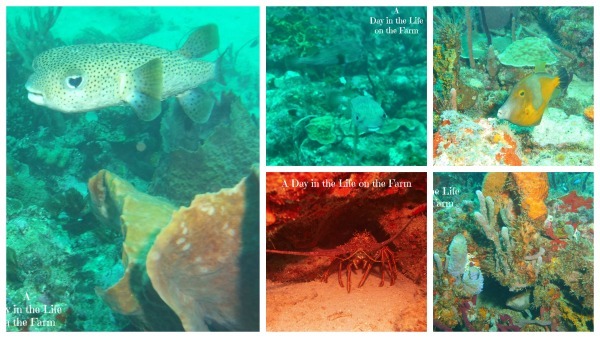 Bugsy, Bruce, Crispin and Dennis couldn't have done anything that would have made this dive experience any better. Friday morning, our last full day, there was no diving. 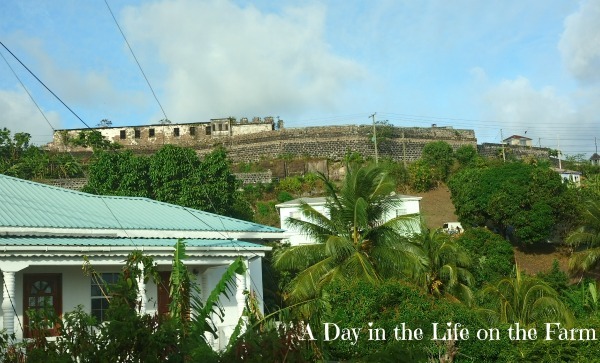 We slept in, had a leisurely breakfast and then met in the lobby at 9 am to tour the Island. Grenada is 12 miles wide by 21 miles long but you would think it was much larger. It is very mountainous so there is a lot of land above sea level in that short distance. 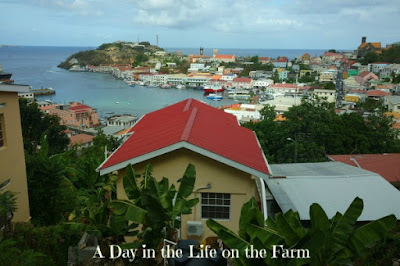 There are 6 Parishes on the Island. We visited 5 of them. 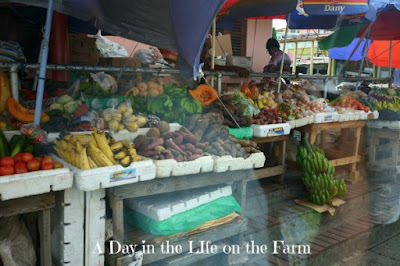 Each little town we drove through has their Farmer's Market going on Fridays and Saturdays. St. George is the largest city on the Island. Their Farmer's Market rivaled our Eastern Market here in Detroit. 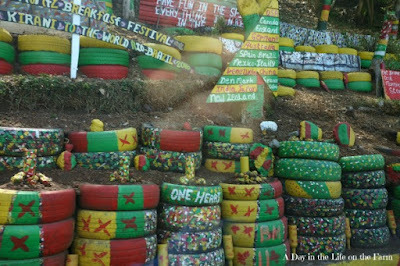 Much of the roadside is decorated with the Grenadian colors of red/green/yellow. There are handwritten signs of goodwill and charity everywhere you look. The USA is well loved by Grenadians and they made it very clear that our tourism is appreciated and needed. Our first stop was a beautiful waterfall where we cooled off a bit and stretched our legs after the trek out of St. Georges which was very heavily congested with traffic. Our next stop was the Spice House. This plantation used to employ over 300 people. In a four year period, the owner, worried that he was going to lose the business due to political uprisings, let the plantation go and it now only has 20 employees. 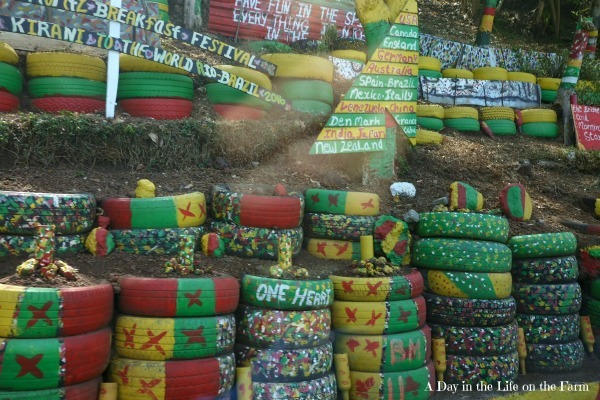 Grenada is known as the Spice Island. It used to be the 2nd largest exporter of nutmeg in the world but a hurricane took out many of it trees, knocking it down to #8. They also export cloves, bay leaf, cinnamon, turmeric, and allspice. This was followed by a stop at the Chocolate Factory. Cocoa is also a huge crop for Grenada and is imported to other countries. 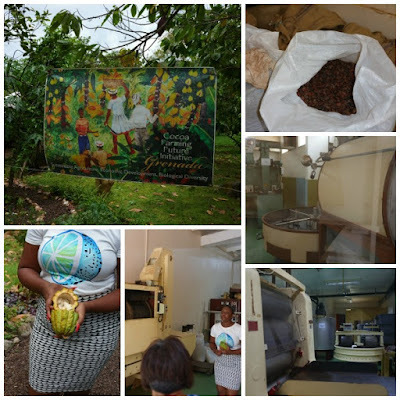 The picture on the bottom left shows a cocoa fruit from which the beans are taken. They are then placed in drawers and covered with banana leaves being turned and stirred each day until they turn a golden brown. Then they are machine sorted for size before being hand sorted for any imperfections before being roasted and becoming the products that we know and love. Lunch was enjoyed at a mountain top restaurant at this rum distillery. 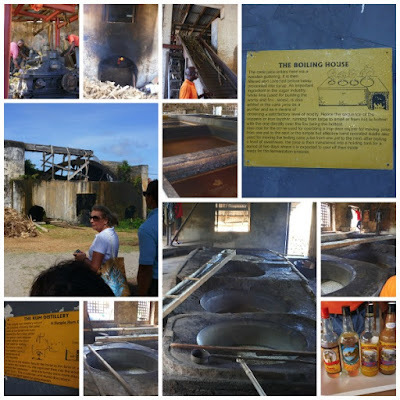 After lunch we enjoyed a tour of the distillery, which is the only distillery on the Island that still presses and makes rum in the same manner as when it first opened in the 1800's. This was followed up by a rum tasting. The ride back took us past this fort where the USA battled with Grenada. We called this an invasion. 93% of the Grenadians called this a rescue mission for which they are very grateful, celebrating it each year with a day they call Thanksgiving. It was a very long, full day. Dinner was ready upon our return to the resort and then we headed to the room to pack up and get ready for our return home the following day. We arrived home about 2 am this morning. It was a wonderful vacation and I will be sharing more about it with you later in the week. I am, as always, very happy to be home. We were still up early this morning. The dogs had no sympathy with us over our lack of sleep so 6 am was still feeding time. We unpacked, started laundry and visited with Jessica for a bit before she left Melody with us to spend the day. We sure did miss that Angel Face. We went to Mass, came home, had lunch and then Little Miss Melody and I took a 2 hr. nap while Grampy mowed the lawn. After our nap we played in the wading pool for a while, started the process to open up the big pool, grilled dinner, ate and now we are watching Cinderella. No big plans for tomorrow but the new room is ready to be painted now so we will probably go and pick out the paint as well as get the rest of the stuff needed to finish opening the pool. The builders will be back to finish up the roof and siding on Tuesday and our carpenter will put the shelving in for the pantry. As soon as we are done painting we can have the tile guy come and put in the floor. Then we will just have to wait for the cupboards to be completed. Hopefully we will be done in another couple of weeks. So here is the Weekly Menu. 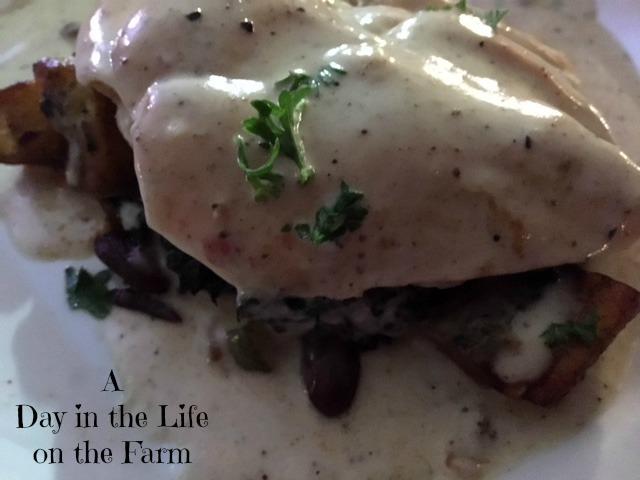 Please stop by each day as I post photos and recipes. 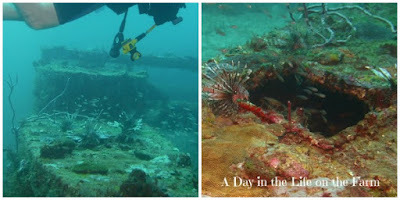 Thursday we went to the Marine Preserve Park for our last two morning dives. 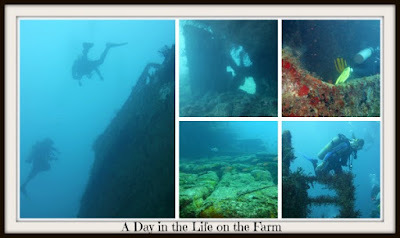 The first stop was a sunken schooner followed by the sculpture park. The current took us around the hull of the schooner. And the we had to fight the current to see the top of the schooner. We then swam into the shallower waters and visited the Underwater Sculpture Park. 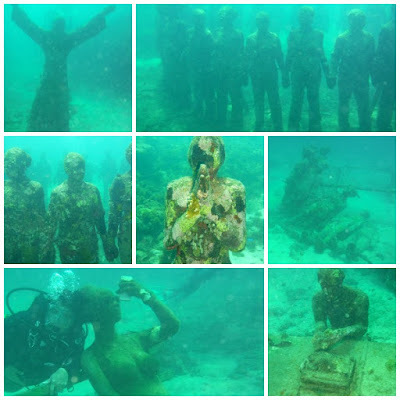 This Park was designed by a local artist using models from the Island to make the faces on the statues. The Park is in pretty good shape except for one area that was damaged by a storm. The bodies were ripped from the stand and now lie in the sand....this is now called the graveyard. 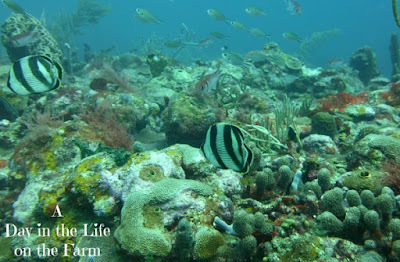 The second dive was another part of the reef system, I can't remember the name of the site. It was a beautiful, vibrant reef with an abundance of sealife, mostly fans, coral heads, and small fish. 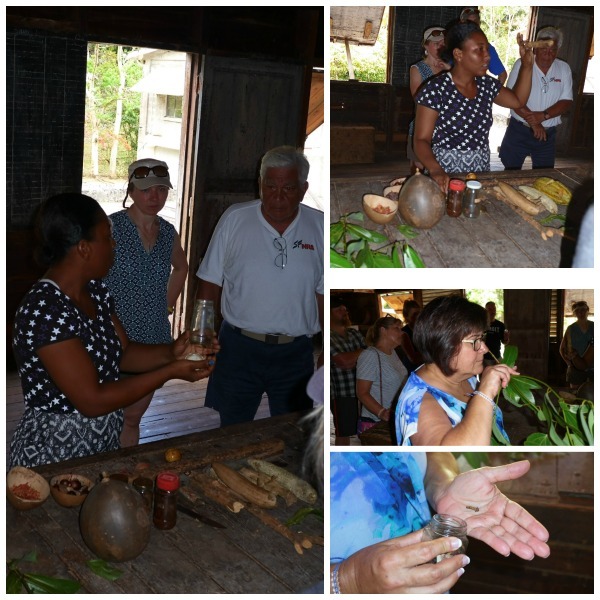 After lunch we attended a cooking class where the chef from the resort shared her recipe for Creole Sauce. The Creole sauce here is very different from what I have made. Now I have the secret ingredient and will be replicating it at home so stay tuned for that recipe coming up soon. 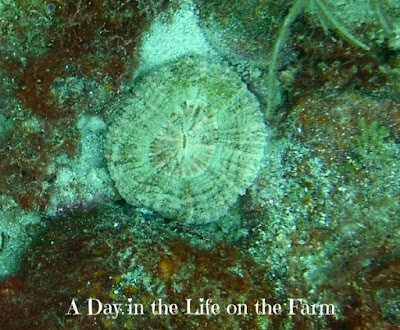 Following the Cooking Class was a night dive of the wreck we did the first dive of the first day. 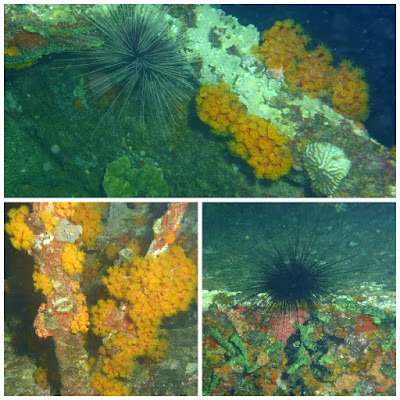 This wreck is in a protected area so there is no current to deal with negating the need for a drift dive. 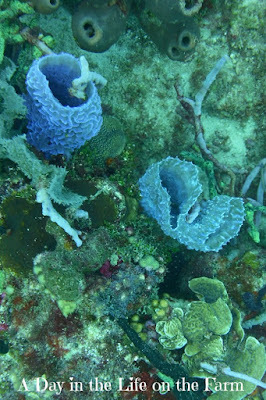 The cup coral was very vibrant, we saw a couple of spiny sea urchin but were disappointed that none of the "thugs" were out. Normally night dives are where you get to see your octopus, sharks, eels, etc. Back to the resort for a late dinner and then crashed. Yesterday was spent touring the Island.....learned so much and have a lot to share with you....coming up next on the blog....see you soon. I did not dive yesterday morning. I awoke in the middle of the night with a terrible migraine and was still in pain and nauseous when it was time to leave in the morning. Frank went and visited our dive friends, Brad and Sherry, who happen to be an ER Doctor and Trauma Nurse. He came back with medication. I was then able to fall asleep while Frank went diving. I awoke around 11 am and felt much better with just the lingering residual effects of the migraine remaining. 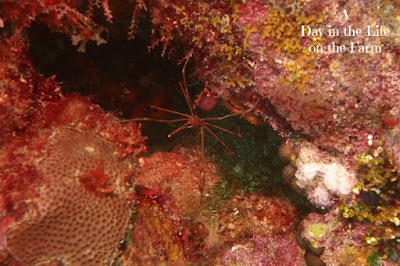 Frank said that the visibility was not very good on the dives. However, he did get some nice photos that he shared with me and I am sharing with you today. I'm sorry I missed this guy. I wish we didn't see so many of these guys. After lunch I went back to the room and rested a bit more, read for a while and went for a massage. By late afternoon I was feeling right back to normal. The resort hosted a cocktail party for all of the guests. We met the owners of the resort and mingled for a bit before heading over to the restaurant and bar area that had been taken over by locals for an evening of street food. This was a lot of fun. 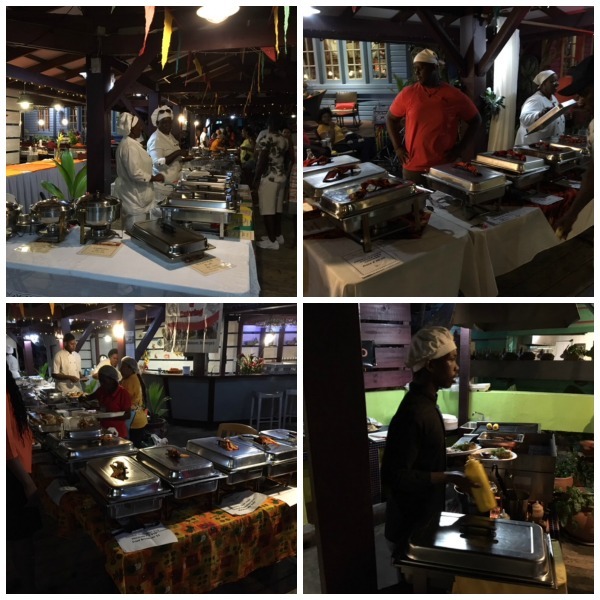 They had different stations with all kinds of local specialties. We were given tickets and were able to pick and choose what we wished to try. The only unusual thing that I tried was the curried goat stew which was absolutely delicious. I got a lot of ideas for what to serve at our after dive party we will be hosting at the end of the month. Off for our last day of diving. See you all tomorrow. 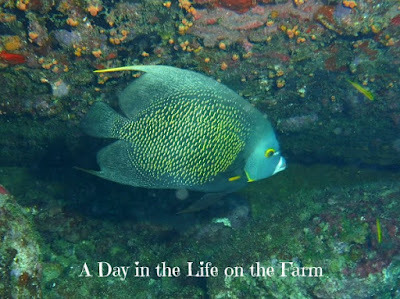 Day 3 of diving was very nice but it started getting a little rough in the afternoon with high winds expected in the evening, canceling our scheduled night dive. 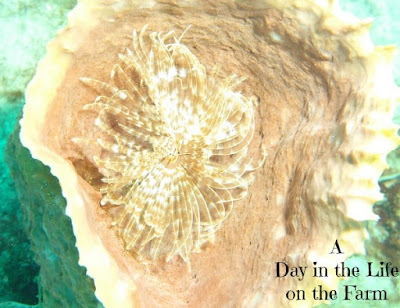 Our first stop of the morning was a site called Windmill Shallows. It contains neither a windmill nor shallows so we are unsure where the name originated. 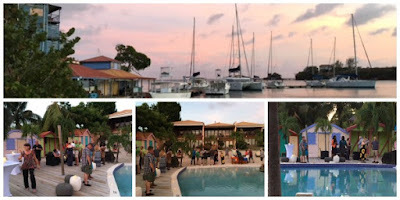 What it does contain is a Catamaran that was used for taking tourists out for rum cruises. One morning the crew came into work and the Catamaran had disappeared. Some time later it was discovered lying on the bottom of the ocean at the dive site. 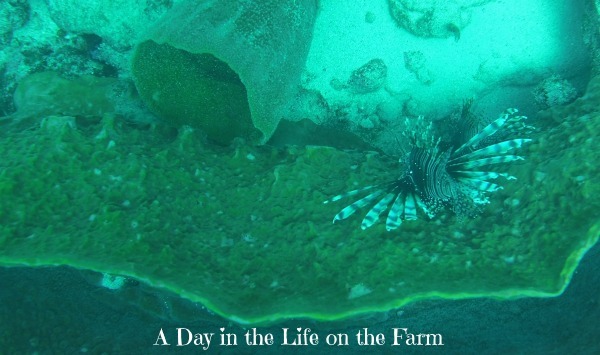 There was an entire colony of Lionfish living on this Catamaran. All stationed right over this feeding hole which is probably why we didn't see much else. 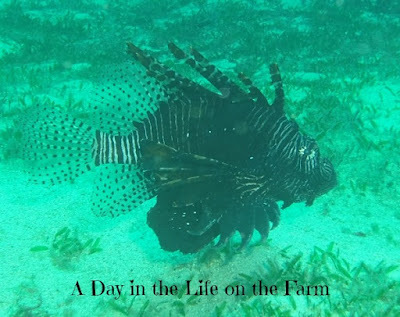 We did see this guy....Who's not afraid of no stinkin' lionfish. And this spider crab who was oblivious to it all. 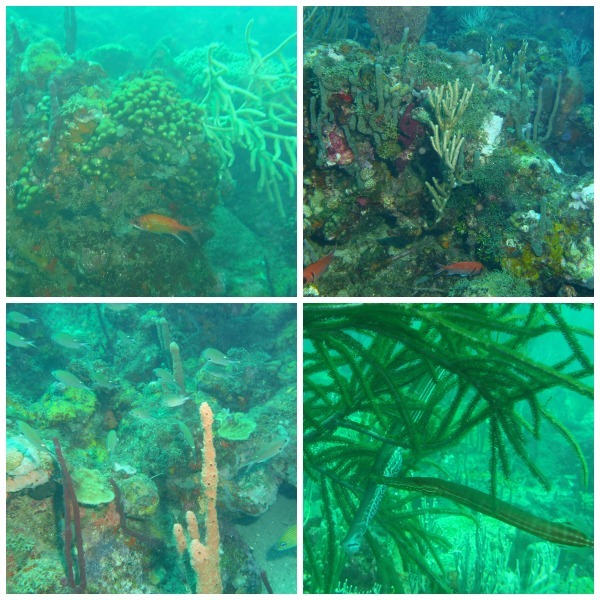 Our second dive was Kohanee, another section of the miles long reef system. 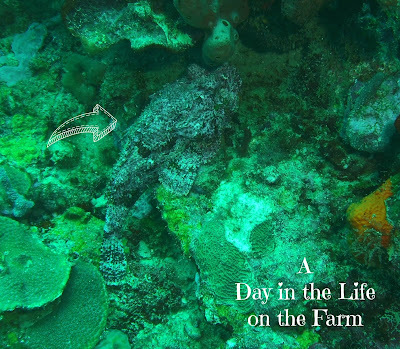 This was a beautiful site with a lot of marine life and gorgeous corals of all kinds. We hung out by the pool after lunch. We had spa services provided with our all inclusive package so Frank went for a back massage and I had a facial. It was so wonderful that I scheduled a massage for today. After our spa treatments we attended a chocolate and rum tasting. We tried many different chocolates from 100% cocoa to 60% cocoa. Some were plain, others were flavored with sea salt, nutmeg and ginger. This is, after all, the Spice Island. My favorite was the nutmeg flavored bar with 60% cocoa. My most exciting find were cocoa tea balls. I picked some up and got the recipe for cocoa tea….we have National Tea Day in June! There were 3 different rums that we tried. The first was 150 proof. It was like taking a sip of lighter fluid. The second was a Plantation Rum to be enjoyed on the rocks, with a sweeter honey flavor to it. The last was a 10XO aged in Bourbon barrels from Tennessee and meant to be enjoyed neat. This last was my personal favorite. Cocktails and laughter before dinner. Music and Dancing during Dinner. Delicious Cajun Shrimp for dinner, that tasted more sweet and spicy than Cajun. And then back to the room for a good night's sleep before diving the next day. This is when my vacation went awry but more about that in tomorrows post. See you then. 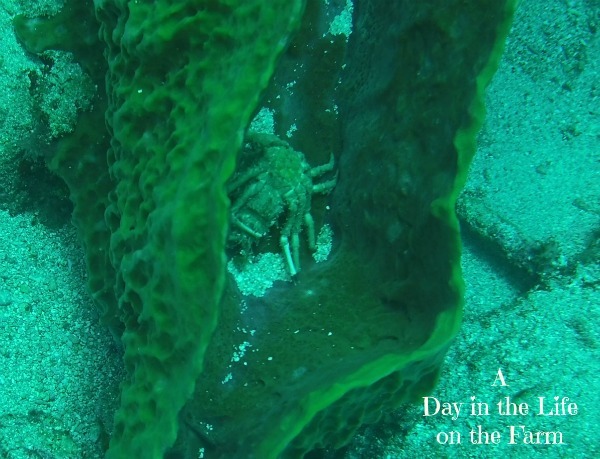 Our second day of diving with Aquanuts was just as wonderful as the first day. The crew that we have is absolutely amazing. 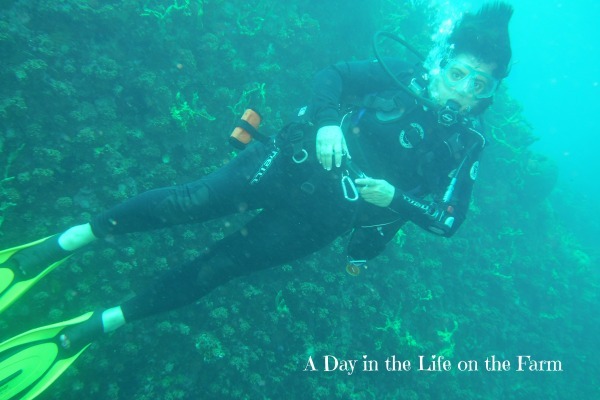 This is the most relaxed dive trip that I have ever been on in my 25 years of diving. The crew takes care of everything!! They even take care of your wetsuits. I have never been this pampered by a dive crew before. 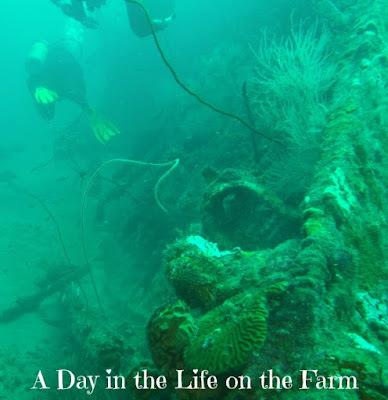 Our first dive yesterday was another wreck called Shakem. This wreck was a ship that picked up building supplies from Trinidad to bring back to Grenada. They overloaded the ship with cement bars, blocks and rods. The weight shifted and that was all she wrote. This is one of the most intact shipwrecks I have seen. 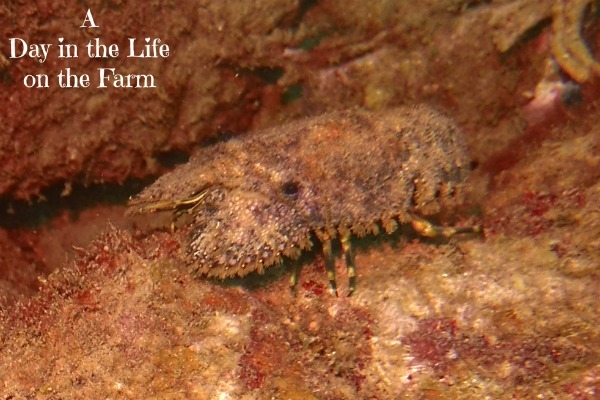 We also came across a shovelnose lobster. I had never seen one before. 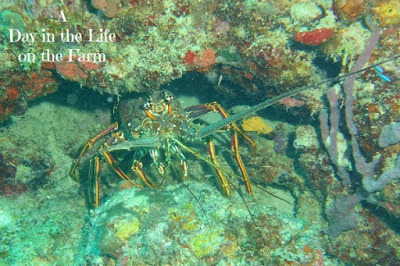 You can see why lobster are sometimes called the cockroaches of the sea. Our second dive was called Escape. 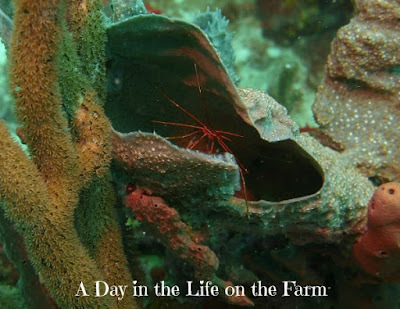 It is part of the same reef system that we explored on Day 1. It is a healthy, colorful reef with lots of small marine life. A lot of shrimp hiding out on this dive. How majestic is God's work! We spent the remainder of the day around the pool, relaxing and reading. I finished a novel I had been given and advanced copy of from The Book Club Cookbook for review. I will be sharing that and the recipe it inspired shortly upon my return home. We are still cooking Mexican in our Kitchen Matrix group this month. This week Cam of Culinary Adventures with Camilla, asked us to be inspired by the section for Mexican Soups. 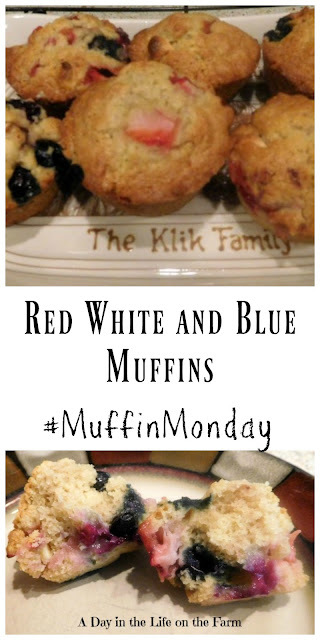 Each Tuesday of 2018 we are making and sharing a recipe inspired by the Cookbook written by Mark Bittman. Bittman's cookbook is more of a cooking guide than a hard and set recipe book. 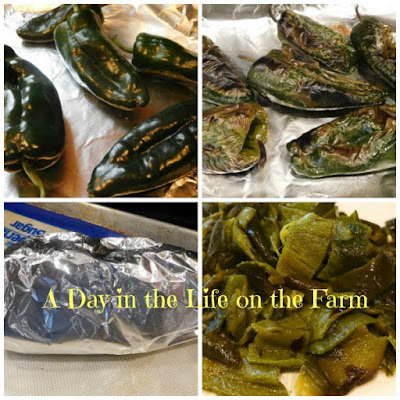 The recipe that inspired me was Bittman's Pork and Green Chile Stew. It starts off having you roast and peel the chiles. This method is the easiest that I have found to date. Line a baking pan with foil and plop on your chiles. Stick them in a hot oven until they blacken and fall into themselves. Wrap them up in the same foil that they baked on and let them steam until they are cool enough to handle. Peel and seed them under running water. The stew itself was very easy to make and impressively delicious. This meal will become a regular in this household. We could not get enough of it. I pretty much followed Bittman's suggestions except that I started with pork stew meat and I allowed the stew to cook much longer. I think stew needs a long slow braise. I like my stew meat to be fork tender. We served this up with warmed flour tortillas. I think it would be delicious over rice too. Tender chunks of pork, tomatoes and poblano peppers meld together to make a warm comforting dinner. Place the peppers onto a foil lined baking sheet. Place in a preheated 450* oven for 30 minutes. Turn peppers over to brown the other side and roast for another 30-40 minutes, until browned all over and falling into themselves. Remove from oven, wrap and seal the foil over the peppers and allow to steam until cool enough to handle. Remove the skins, seeds and stems under running water. Coarsely chop the peppers and set aside. Place a dutch oven over med high heat. When pot is hot and the pork and onions. Season with salt. Cook and stir until pork juices evaporate and the onion is translucent. Add the garlic, cook and stir for 30 seconds. Add the tomatoes. Fill the tomato can with water and add to the pot. Bring to a boil and add the chopped chiles. Reduce heat to a simmer, cover and cook until the meat is fork tender, about 2 hrs. Serve with warm tortillas, if desired. Adapted from The Kitchen Matrix Cookbook. Please stop by and see what Mexican Soups the others are sharing. Grenada is a lovely island and our resort, True Blue Bay, is everything you could want. Our rooms are lovely, the food is delicious and the service is excellent. I will be posting photos and more about this wonderful resort in which we are staying later in the trip. Today I want to share our diving photos from yesterday. Our first dive was a wreck called Veronica. 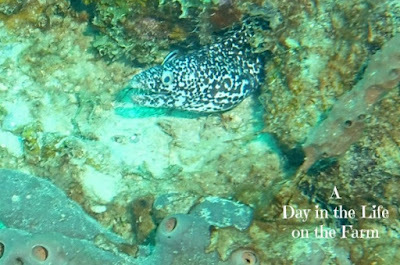 The visibility wasn't great but it was a good spot for the divemasters to get to check out our group and learn our strengths and weaknesses. Good divemasters always get to know their students in locations where they cannot cause too much damage before taking them to the better locations where buoyancy control and respect of the ocean is so important. That is the ship in the backdrop, filled completely with cup corals. We did find this guy who is camouflaged so well. And this deceptively gorgeous but evil guy who is probably the reason we didn't see much else. 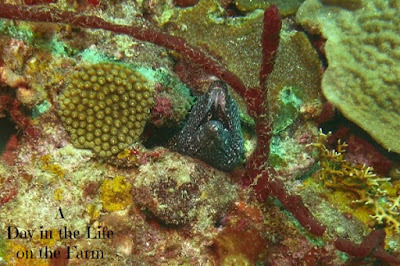 This green moray eel thought he had found a good hiding spot. Our second dive was at a site called Northern Exposure. Northern Exposure is part of a large, 6 mile long reef, that we will be exploring all week. 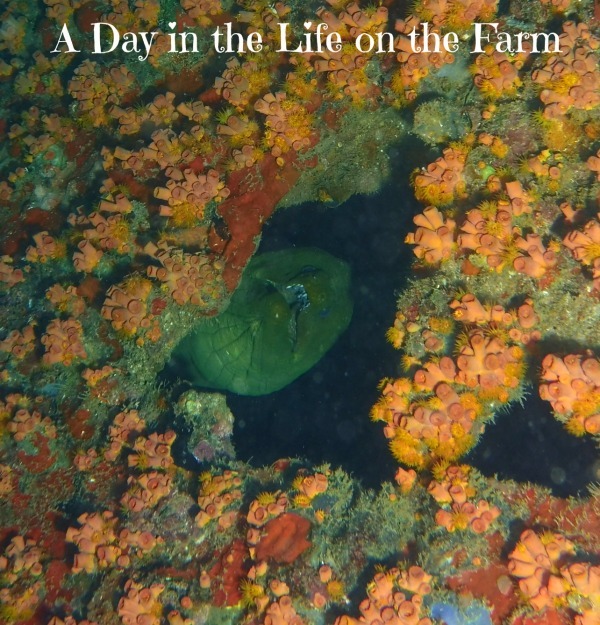 The visibility was much better and the sealife, while not prolific, was an improvement over the wreck. This spotted moray eel popped out his head to say Hey. This guy came out right before lunch just to make our stomachs grumble. 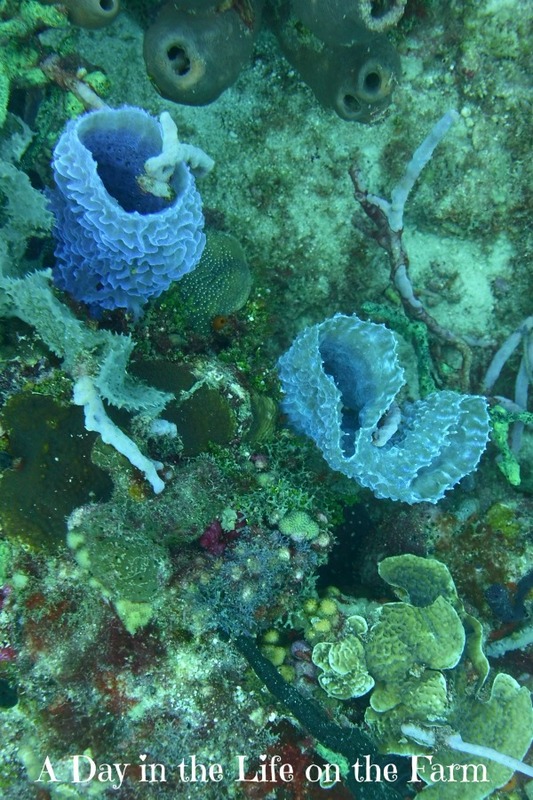 And some beauty to finish up Day 1 of Diving. I always try to eat as much local food as I can while on vacation. Dinner was Chicken Calaloo over a bed of roasted plantains. It was delicious. I was afraid I would have a hard time sleeping after that 2 hr. nap but not to worry. Traveling caught up to me I guess. We just got back from Day 2 of diving. I am writing this while I wait for Frank to shower so we can have lunch. See you all tomorrow with more photos.